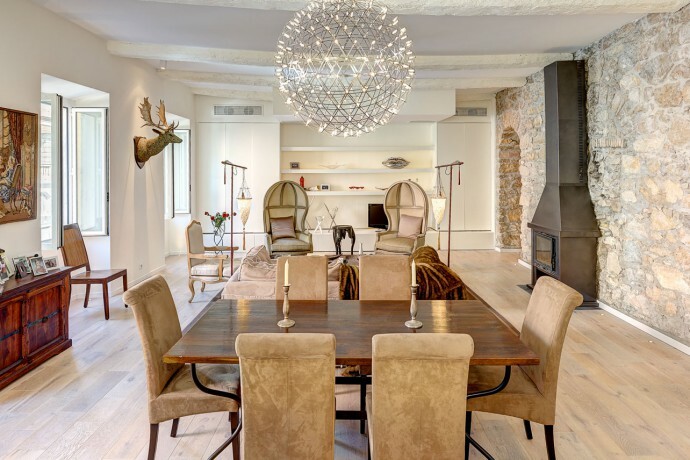 Callender Howorth is a full-service interior architecture company, specialising in high-end interior architecture in Nice for residential properties and commercial spaces. Although our headquarters are in London, we also have an office in Nice and we are happy to intriduce our Nice interior architects. We have built a reputation as highly skilled interior architects in the South of France and our expertise in multi-discipline luxury design is sought on an international level. Our portfolio of completed projects reflects the diverse talents of our Nice interior architecture team, as well as our commitment to creating bespoke solutions for our discerning clients. The charming city of Nice offers a great introduction to Riviera architecture, inspiring our Nice interior architects on a daily basis. The Promenade des Anglais, the main coastal boulevard, is buffered with ornate 19th-century and early-20th-century buildings, making the palm-lined walkway an architectural treasure trove; the pastel-hued structures perfectly evoke the Belle Epoque and Art Deco eras. Le Negresco Hotel is probably one of the most celebrated, photographed and filmed buildings in Nice. Recognisable by its iconic pink dome, it was built on the site of the former Sacré-Coeur convent in 1912 by Dutch architect Edouard-Jean Niermans, who also designed Le Moulin Rouge in Paris. Sculptures by Michel de Tarnowsky adorn the façade. Gustave Eiffel designed the main lounge’s impressive cupola and the interior architecture matches suit in its majesty. The nearby Palais de la Méditerranée, built in 1927, is a prestigious casino hotel. Charles Dalmas designed it, and its imposing neo-Classical facade depicts winged horses, nymphs and deities. Nice is undoubtedly the Riviera’s capital city of culture and art. In fact, it comes second to only Paris in terms of galleries and museums, and it’s also France’s soul in terms of festivals and cultural events. The most famous gallery is the Musée Matisse, which follows the artist’s development from his first paintings in 1890 to his death in 1954. A visit to this exhibition should be followed with a trip to Matisse’s chapel – full of bold green, blue and yellow stained glass; it’s located in the nearby hill village of Vence. Just down the hill, the Maeght Foundation houses sculptures by Giacometti, Braque and Miró, and is set among peaceful Mediterranean gardens. The Marc Chagall Museum follows a Biblical theme and is the biggest public collection of works by the artist. The Palais Massena is an architectural gem that traces the history of Nice through painting, sculpture, jewellery and tapestries. It was inaugurated in 1921 and has an important library of historical documents. Callender Howorth’s interior architects in Nice renovated a well-appointed holiday home in Rue Bonaparte. This Nice apartment was in desperate need of an overhaul as it had not been renovated in fifty years and yet the location was perfect, situated near the port and overlooking a peaceful courtyard. The clients wanted to keep some of the features, namely its quirky stone walls and beamed ceilings, but apart from that, we gutted the whole building and started from scratch. Five rooms were knocked down to make way for a huge open plan living space, including a kitchen and dining area. The stone wall in this space was sand blasted back to its original honey-toned glory to become a stunning decorative centrepiece. Adding custom-fitted lighting, bespoke furniture and art pieces completed the stunning interior architecture project in Nice. Nice is the cultural hub of the Cote d’Azur, an extremely vibrant and cosmopolitan city. The region’s diverse natural splendour means you are right by the sea and the mountains are just a short bus ride away making it uniquely placed for watersports and skiing. It’s a great place to experience Mediterranean life since the entertainment and shopping options are plentiful. Commerce is mostly boutique-driven, restaurant quality is superior and locals still buy produce at the open markets and meat from the butcher. Yachting industry is also developed in Nice. L’ane Rouge is an exceptional portside restaurant which has been awarded a Michelin star. In summer you’ll need to book in advance for an outside table with views of the illuminated Parc du Château and the plethora of superyachts beyond. La Petite Maison is located opposite the Opera House and is the late-night dining spot of choice for the international jet set that crave regional cuisine. Keisuke Matsushima is a great spot for exquisite French cuisine with an Asian flavour, prepared by a chef who takes the time to meet diners. Why do you want to live in Nice? Which famous residents live there? The mild climate and Mediterranean lifestyle make Nice an appealing place for all personalities. Nice is well placed for families since there are a number of good schools in the area, including international schools. The most central one is the International School of Nice (ISN), based just a 15-minute drive from the centre of town, it educates children aged 4-18 years. If your children are in primary or middle school, there are some smaller bilingual schools such as EIB (Ecole Internationale Billingue – Pégomas, Nice, Cagnes, Angers) that combine lessons in English and French. One of the region’s most famous residents is Elton John, who bought a luxurious villa with interior architecture and gardens so stunning that they featured in their own book, Elton John’s Flower Fantasies: An Intimate Tour of His Houses and Gardens. Please contact our team of Nice interior architects to discuss your requirements. Complete design, build and project management service in Nice.